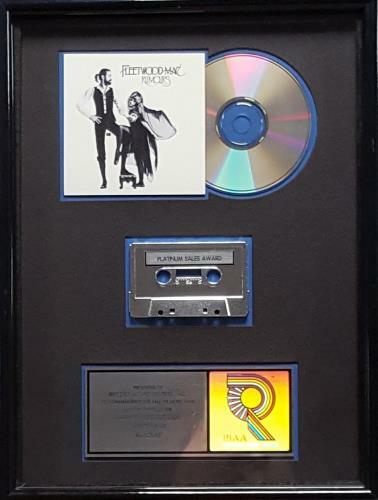 FLEETWOOD MAC Rumours (Rare official US RIAA Certified Platinum Award issued to commemorate American CD & Cassette album sales in excess of 1,000,000 copies. This nicely framed and glazed award measures 13" x 17" in size, and features the album artwork overlapping a Compact Disc at the top, 'Platinum Sales Award' cassette shell in the middle and the authentic, custom engraved dedication plaque with 'R' style RIAA hologram at the bottom. All mounted on a blue background with a black surround in a black plastic coated wooden frame. A really nice item). or visit our Fleetwood Mac image gallery.